Introduction: Hosting is essential to publish and maintain websites or blogs in general. Web hosting has been pretty common since long and the buzz these days is cloud computing and cloud hosting. Let’s understand what they are and figure out the five key differences between them. Web Hosting: The traditional web hosting only utilizes one server for all its needs such as storage, bandwidth and database. There are again different types of web hosting such as Dedicated web hosting which means you get to use only one system of yours to one server and shared web hosting lets you share your PC’s to a single server. The major advantage of this type of hosting is its cheap cost. Cloud Hosting: This uses multiple servers and uses cloud computing technology to its potential. Cloud hosting is great for people that depend on bandwidth and speed and tolerate no issues from the server. But all the perks of cloud hosting do come with the hefty price tag. Many e-commerce sites run on cloud computing because they can’t afford to be down when so many payments and purchases are being made. Let’s have a look at the five differences between them. Web Hosting: Web hosting is great for people with small businesses online or blogs meant for small traffic. As it uses a single physical server, there is no backup and even with SSD server that are comparatively much faster than HDD ones, there is a chance of it getting slow or down because of the limited resources as discussed before. Therefore, web hosting is not recommended for big corporations running websites that garner more traffic daily. Cloud Hosting: Cloud Hosting is a clear winner as it doesn’t depend on a single server but on various ones. There are multiple servers and even when couple of them are down, it has the capability to handle many websites. It is recommended for e-commerce sites and big businesses that gain large traffic. Therefore, Cloud hosting wins the battle of performance. Web Hosting: In this type of hosting, security is only cased through applications and as such, it is fragile in nature. It can be hacked and can be corrupted if it is once entered through hackers. Therefore, all people using web hosting must make every effort to keep themselves safe from vulnerabilities by enhancing their security levels through simple procedures like changing passwords often and having a strong antivirus and antimalware software. Cloud Hosting: These type of servers use enhanced algorithms that are incorporated into the server such as preventative controls and detective controls. It lets the user take full control and while they too are vulnerable to attacks akin to traditional web hosting, they have better backup and security control system which make them win this battle. Web Hosting: Web Hosting companies try to get customers through bonuses and have many offers in had such as domain names and free websites. In the matter of support though, web hosting beforehand may promise you unlimited plans and features, but fail to keep up to it just because of constrained resources. 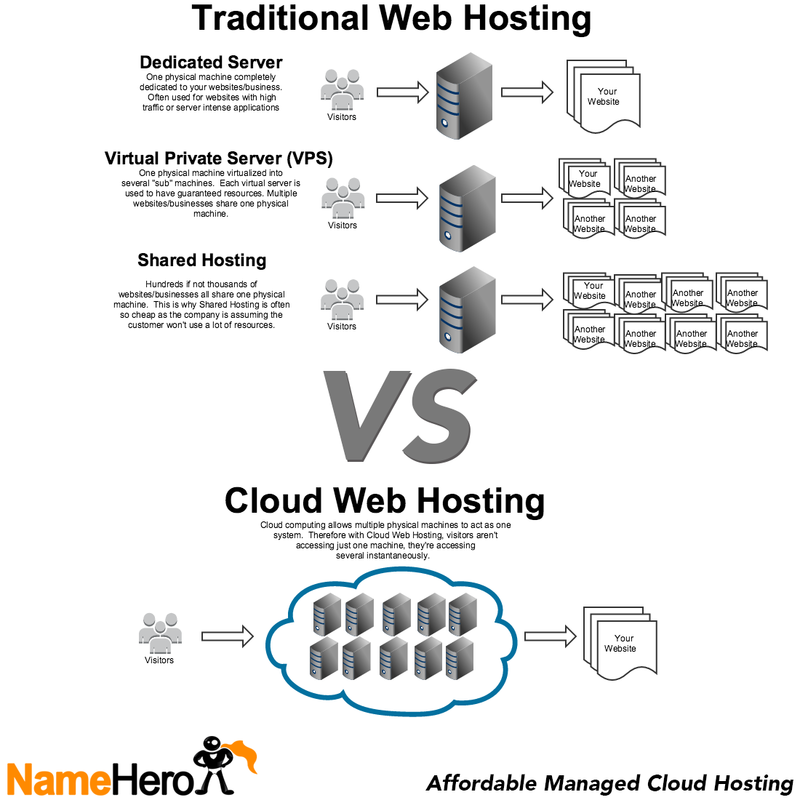 Cloud Hosting: Cloud users have less perks and benefits compared to web hosting users. Hence, in this regard, web hosting gets the upper hand and is the clear winner. In terms of support though, Cloud hosting wins the battle as they get lots of storage up to unlimited and speed too. Support for cloud hosting is impeccable and there are various workarounds if you happen to land a problem. Web Hosting: Web hosting has limited bandwidth and other resources and as such, it fails to keep up to huge traffic. For instance, if there is unprecedented traffic on your website, the server reaches its capacity and breaks down. People will have tough time accessing your website. They will have to be patient and wait till the issue is resolved. Cloud Hosting: Cloud hosting is excellent in this regard. As the resources are pretty well distributed and maintained, there is no speed problem arising. When you have high traffic, you do not get stuck and can use the website as other resources are distributed to serve you. Hence, another hands down win for cloud hosting. Web Hosting: Web hosting is pretty cheap as it has limited resources. It comes in monthly plans and you cannot exceed them. It’s just like your broadband plans. It can be even more cheap if you buy it for a longer duration. On top of that, you get many offers and bonuses and can be pretty amazing when you are on a budget. It’s very useful if you run small websites and want cheap hosting plans. Cloud Hosting: Cloud hosting is all about usage. You pay for what you use and when you have lots of programs lined up and don’t use them a lot, you can land a pretty expensive price. Hence, you need to disciplined and keep track of what you are using when on a cloud hosting plan. All in all, it’s not recommended or small traffic websites. Web hosting is a winner in this regard. Conclusion: As you saw, cloud hosting is a clear winner if all you want is performance, speed, support and security. It is recommended for large websites and blogs that attract huge traffics. But, it can hurt your wallet and is quite expensive. On the other hand, web hosting is pretty cheap and is a clear winner if all you run is a small blog or website that doesn’t have to run amazingly fast all the time. It’s great for people on a budget. Security needs to be taken care of in this regard. Choose wisely the type of hosting service you need depending on your requirements and boil your needs down to security, support, speed, performance and pricing. There are various providers of both web hosting and cloud hosting and you can get to know more about them both online and offline. It’s good to know the differences between web hosting and cloud hosting as we can choose the batter one that suits our purpose the most. Hosting is deciding factor for maintaining websites and blogs. After reading your article i agree that cloud hosting is the better option if affordable. No, doubt cloud hosting is trending now days. Something better to have in sense of security and storage facilities in one. that we have to pay what we use not more or less, but the price could be generally high for some people.